Directed by Irene Papas, performed in Italian. The theatre (left)on the morning before the performance: some impression of the heat (in late May) can be gained: the performance began at 6.30 pm, by which time it was a little cooler, and there was a pleasant breeze, blowing up the dust at the front (appropriate for the Guard's second appearance!). But unlike the original performance, which I like to suppose started in the gloom of early morning and used the sunlight appearing over Mount Hymettus as the chorus entered, this began in brightness and moved towards the dark. 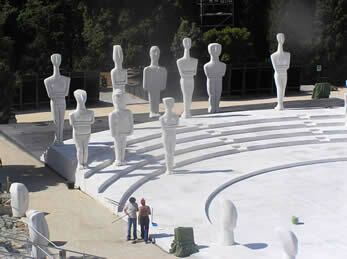 The set consisted of a white circle with shallow steps upstage, on which stood an assortment of gigantic naked figures, male and female. Immediately the question arose: why on earth? 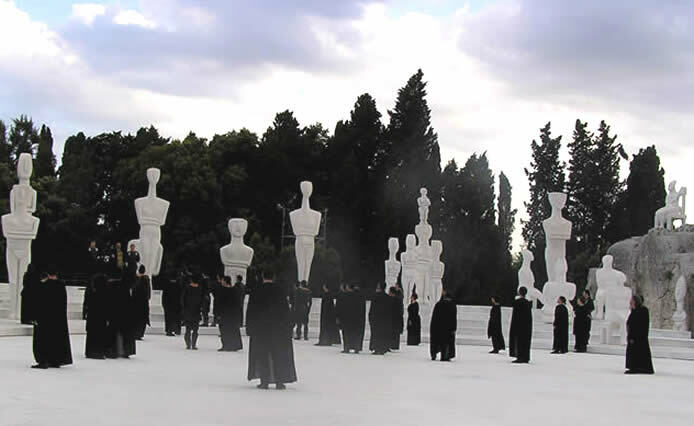 The inspiration was obviously intended to be the mysterious Cycladic figurines, which can be seen in the NAM in Athens or in the British Museum. But (a) the originals are tiny - images that ask to be felt or held in the hand and (b) the Cycladic originals were as remote from Sophocles as Sophocles is from us (about 2500 years in each case): except that we know of them and Sophocles didn't! So a piece of design for design's sake then? Having said that - if one knew nothing of Cycladic art at all, the giant figures were curiously impressive - faceless, remote: divinities that would seem oblivious to human action (is this what's wanted though? Are gods in the drama oblivious to the human tragedy unfolding beneath them? Perhaps this production's gods were not quite as bizarre as in the so styled "Oedipus trilogy" performed at the National Theatre in London a decade or so ago, where Apollo and Dionysus (why them?) were present throughout, symbolised by two huge balloons suspended over the auditorium! 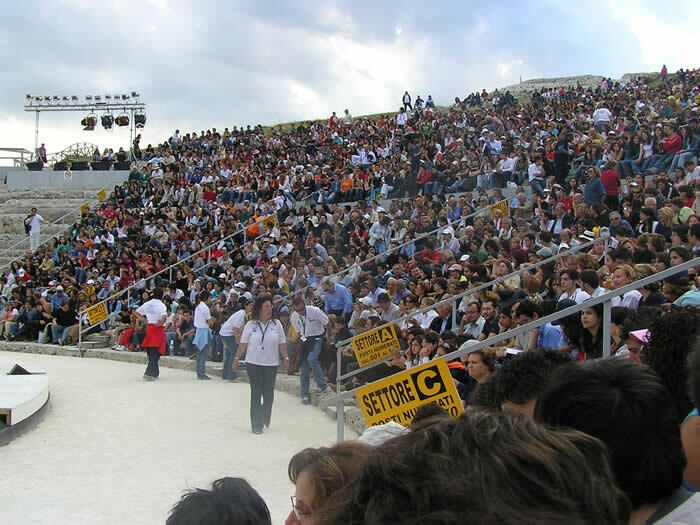 The cavea was full from at least 5pm, mainly with large student parties happily texting, ipodding and playing computer games. I arrived at about 5.30 and managed to squeeze in at the end of the second row: more conventional theatregoers - arriving after 6pm properly dressed up - found it difficult to find places without climbing to the very top, where many people were already sitting on the grass. I was glad of my hired cushion, as the marble of my seat had eroded more than somewhat. 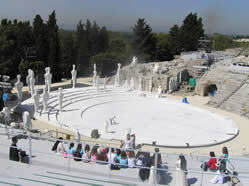 But it was a fine sight to see a Greek theatre full and buzzing with conversation. The play opened thrillingly with an ear-shattering scream (the production had not trusted the ancient acoustics - all performers wore microphones: this encouraged the audience to chat assuming they could not be heard. But a background noise of screaming low-flying swifts - or cooing pigeons as in the Globe theatre in London - would have been more acceptable. It spoiled the intimacy, and forced all actors to up their volume). Antigone and Ismene sprinted across the huge orchestra cowering as bombs were heard to land around them, but there was nowhere to hide: a city under heavy bombardment was suggested very simply with just sound and movement. The actors in black were starkly silhouetted against the white background, fading to a bloodstained pink as the sunset progressed from our right (orientation of this theatre is the same as the Theatre of Dionysus in Athens). The visual impression - two tiny figures alone in the great empty circle beneath the towering divinities - underlined their isolation and powerlessness. The chorus, as seems inevitable in modern productions, were treated as individuals: although the sheer weight of numbers filling the arena added considerably to the spectacle: but a specific chorus role could not be established with them occupying the same space as the actors: so the overall effect was alienating rather than assisting the audience to feel included in the drama. Visually the production was a brilliant success. The huge chorus helped fill the enormous orchestra - there must have been 50 - 60, including the four leaders, guards, men women and singers. 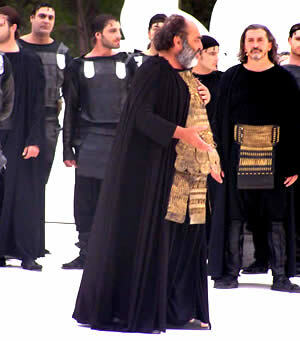 Antigone changed into a flowing white robe as the bride of death: the only white costume against the sea of black, apart from Eurydice, regal in scarlet - the only colour on the stage at any time. I'd quarrel, though, with having her come on "before her time" with Ismene to place a bridal head-dress on Antigone before she is taken away to her death-prison: surely the dramatic effect of having her appear to listen to the messenger's speech about her son's death is then lost: we had never considered before that Creon even had a wife. Tiresias went into a trance and delivered his prognostications from a supine position (not quite sure whether this was brilliantly effective or another moment in danger of descending into comedy: on balance I think it undermined his credibility - he is emphatically not in a trance when he foretells Creon's future!). 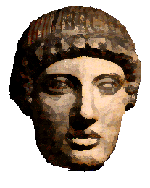 To conclude: Greek tragedy is not opera (although Opera was invented to recreate Greek Tragedy, of course): true, it similarly uses every means possible to engage the emotions - but its speeches are not just a series of arias to be applauded. Someone once defined etymology as a science where the vowels count for nothing and the consonants for very little: this was a production where, of Aristotle's two staples, plot counted for nothing and character for very little.